Inside: Dollar-cost averaging can help reduce risk and smooth out price fluctuations of investments. Find out what dollar cost averaging is and how to use it to your advantage. With the stock market fluctuations, it can be confusing to know when is the best time to invest. The answer, of course, is when markets are low and will later go up. How do you time that? Hint: you can’t. But if jumping into investing seems scary or you worry about market turbulence, then dollar-cost averaging may help. How does dollar-cost averaging work? Is dollar-cost averaging right for you? Dollar-cost averaging (DCA) is when you invest roughly equal amounts of money on a regular basis, ignoring any swings the market may encounter. This can smooth out price fluctuations and lower your risk. This means if you’ve decided to invest $100 a month, you do so no matter what craziness you hear from market gurus or from the guy in the corner cubicle. You know, the one with the ever-present ticker streaming across the bottom of his computer screen. Let’s say you get a lump-sum of $720 from a bonus, tax-refund, or your aunt, and you want to invest it. If you opt to invest $120 a month for the next 6 months, that would be dollar-cost averaging your investment purchase. By using dollar-cost averaging, the investor was able to buy more shares with the allotted funds when the price dipped. This reduced the average cost per share for the investor. Here, you can see that without dollar-cost averaging, while overall the share price has risen, all of the shares were purchased at a higher price than was the case with the previous scenario. Because of this, fewer shares were bought overall. You may be wondering if DCA is a good way to invest. If you aren’t already investing, it is an excellent way to create a new habit and become disciplined in your saving and investing routine. You will be avoiding trying to time the market and learn to “stick it out” whether the market is going gangbusters or tanking. Because you are purchasing investments when the market is high, low, and in-between, DCA minimizes losses in bad markets and reduces the amount of risk you carry. Also, if you don’t have a large up-front sum of money to invest, dripping in smaller amounts can be easier on the wallet when you are just getting started. You might wonder, is dollar-cost averaging better than lump-sum investing? Vanguard has done a couple of studies, one in 2012 and one released in 2016 that found if you have a large lump sum available to invest, then dollar-cost averaging outperforms investing it all at once only about ⅓ of the time. Or, stated another way: If you have a large amount of money ready to invest, then over the long term you may have better returns by investing the money all at once rather than dripping it out over time. Dollar-cost averaging tends to come out ahead when the market dips during the period over which you are buying shares and then rebounds. 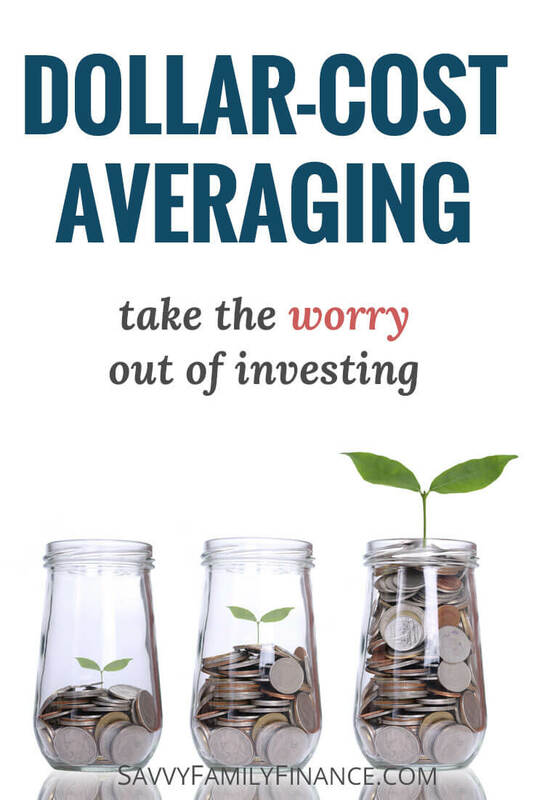 On the other hand, if you have limited resources and are relying on paychecks for having funds available for investing, then dollar-cost averaging makes a lot of sense and is better than waiting and trying to time the market. At work, you might already be dollar-cost averaging your investments and not even realize it. If you are directing a portion of your paycheck to go to a 401(k) or similar plan, you are investing a set amount on a regular basis. This is actually an excellent way to get started. There are also ways to set up dollar-cost averaging with your broker. You will want to first select investments to purchase, such as a stock, ETF or mutual fund. Then you will want to arrange a scheduled funds transfer. While many brokers offer a way to purchase at regular intervals, you can also set up a calendar reminder to yourself to initiate a purchase on the first of each month (for example). An often ignored downside to dollar-cost averaging is the trading costs. However, many brokerages these days have low trading fees. Another downside to DCA is that if the market goes up, you may lose out on gains you would have had if you had done a lump-sum investment. However, if the market does go down during the period you are dollar-cost averaging, then you will come out ahead if the price of the investment later increases. Of course, if you are participating in a 401(k), you are already dollar-cost averaging some of your investments. Outside of that, if you worry about market timing or want to get started investing with smaller dollar amounts, then dollar-cost averaging may be a good approach. If you have a larger amount of money to invest and are less worried about when you invest, then making a lump-sum investment will likely work well.